Bob from New York. Great guy. The person I bought my 82 A and B uncut sheets from. He is very close with David Shultz. This is really cool. Bob from New York sent me this pic yesterday. Dr. D. devotes an entire page of his book to showcasing his personal Rax card. I think it is awesome that he takes personal pride in it. Edit: No clue why pics continue to post sideways when I upload them. Last edited by Dpeck100; 05-06-2018 at 06:42 AM. That is Dr. David Shultz card. He had one before any of us did and wouldn’t sell it. Nice to see some cards get listed! Looks like they spent some time on the floor at the event! Very solid final price of $785. I had estimated I thought this would finish between $700 and $800 and personally I think that is a very strong price for cards that are in such poor condition. My 2k for the sealed set is not looking bad! While the set looks a bit dated and the quality suspect, I like this set as it's truly rare. A legit run of 1200 sets total? Wow. I as tempted to bid, but with the missing cards and stains I passed. What would those grade out as with the stains and all? Last edited by silvor; 05-20-2018 at 08:57 AM. Some of the cards had severe paper loss so I would bet the range would have been probably 1 to 4. I had put in some bids not really thinking I would win but at a range where had I won I could have gotten some of the cards signed and felt good about the price paid. This is one of the few sets where just having the cards is what is more important than the grades. Obviously nicer condition cards will bring more interest but you don't see many relatively modern sets of cards from any genre that will sell at this price in such poor condition. After they were listed I really liked the cards more because I think the damage gives them character. Almost like someone picked them up off the floor from the venue. Pretty cool. I also thought the final price was pretty strong. I know the set is extremely rare, but the star power of the set does not compare to the Wrestling All-Stars. Other than Dr. D. and, to a lesser extent, Robert Gibson, Dennis Condrey and Bobby Eaton, most of the names in the set are not going to be recognizable to fans of today. Even Haku is not going to be recognizable to casual collectors under the "Prince Tonga" moniker. Most of the stuff in my collection are cards where collectors can't be picky about condition because they come up for sale/auction so infrequently. I don't know how familiar you are with old timey baseball cards, but I love the "character" of 1915 Cracker Jack cards that are stained with caramel residue showing that they were obviously in packages of Cracker Jacks at some point rather than pristine examples that obviously were dispensed through the mail-in option that was also available for the set. I have written this on here before, but I love cards that may show up only once a decade so much more than 52 Topps Mantle's or T206 Cpbb's that can be had any day of the week if a collector is simply willing to spend the money. My heart skips a beat when I get an occasional e-mail notification that one of my eBay alerts has gone off. Some of my favorite cards are $200 cards that I have only ever seen for sale/at auction one time. Based on how elusive the Rax cards are, I fully understand why it is such a cool set to hunt down. Last edited by Bored5000; 05-20-2018 at 12:31 PM. Yes I am familiar with the Cracker Jack cards and I think it is great when you see some that survived and are in nice condition with the natural staining. These unfortunately have paper loss but that said if you want the cards you can't be super picky. My situation was perfect because I got the chance at nice cads and they were nice cards. 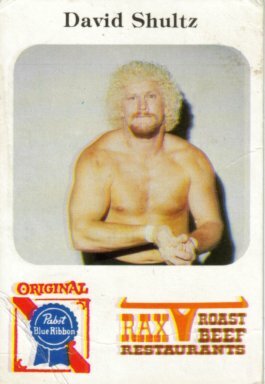 There are really not any other cards from the modern era of professional wrestling that you can't find in a short period of time in some form. That is one of the really cool things about older wrestling cards like Rob collects where something might not surface for years or you find a new card you didn't even know existed. Collecting is fun on so many different levels. Seeing the Bobby Eaton card reminded me of Jim Cornette mentioning many times on his podcast that Eaton was the nicest guy in the wrestling business; nice to a fault. Cornette told a story of he and the Midnights stopping at a liquor store in a sketchy part of Dallas one night after the matches to buy some beer and soda. Ten homeless guys are sitting in front of the liquor store, and Cornette was too scared to leave the car. Eventually, Cornette and Dennis Condrey are in the car waiting for Eaton to come out of the store, wondering what is taking him so long. Finally, Eaton comes out of the store with his arm around a vagrant. The homeless guy was smoking a cigar that Eaton had bought him. Eaton had also gotten talked into buying a grocery bag of booze and food for this guy he just met. Upon seeing this, Dennis Condrey told Eaton that he just got that guy murdered when all the other bums see that the guy has a supply of booze and food. Last edited by Bored5000; 05-21-2018 at 10:05 AM. Cornette told a story of he and the Midnights stopping at a liquor store in a sketchy part of Dallas one night after the matches to buy some beer and soda. Ten homeless guys are sitting in front of the liquor store, and Conrette was too scared to leave the car. Great stories about Eaton. Funny, because I just HATED them back then. Thought they were the biggest pricks in the world. Even though I knew something wasn't on the up and up, it was at least real in the moment. Now it's "I play a character on TV..."
Over the last couple months, I have binge listened to hours and hours of old Cornette podcasts. I would occasionally see a story that he told referenced on one of the wrestling boards I read, but I didn't realize how informative and entertaining his podcast is until I listened for myself. When you do an SMR story you never know when it is coming out. I got a text from Rob that I saw at 3:30 AM that it was out and had a hard time going back to sleep. I decided to go out to the mail kiosk at 5:45 just to see if maybe the magazine was there and it was. I am really excited about this article. It really came out great! Awesome to see wrestling cards get some love. This isn't a criticism at all, but I am kind of surprised that SMR did a story on the set because it is so obscure and does not have a lot of star power. Maybe I should try to sell them on a story on my 1972 STP Racing set. Last edited by Bored5000; 09-27-2018 at 10:49 PM. I was thrilled when Kevin the staff writer contacted me about doing it. Having Bob from NY and Scott Teal participate made the story. An article on that set would be a great one. I thought it was super cool that this popular wrestling site out of Canada picked up on the article and put it in their news section. Pretty awesome!